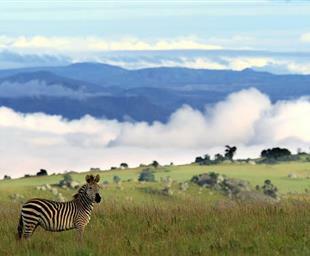 Nyika National Park is Malawi's largest park with an area of 3,200 square kms. It extends across the great plateau which is essentially a granitic dome and its environment is like none other in the whole of Africa. The name, Nyika, means "where the water comes from" and it is one of Malawi's most important catchment areas. The rolling scenery is at its best in the rainy season when over 200 types of orchid are in flower. The grasslands of Nyika are rich in wildflowers in other seasons. For birding enthusiasts, the park has a lot to offer with over 400 species recorded. The rare Denham's bustard and the wattled crane are among those to be seen, as is the red-winged francolin - endemic to Nyika. Vwaza Wildlife Reserve, an area of marsh and plain, with a few rocky outcrops, is 1000 square kms and lies along the Zambian border north-west of Mzuzu. 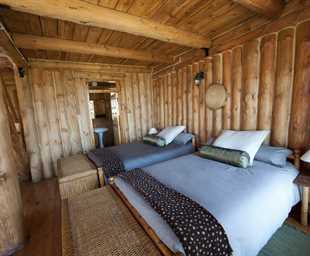 The reserve has a wonderful mix of vegetation: forest and grassland, thin woodland and marsh. It is this rich habitat that attracts a superb range of birdlife. Nearly 300 species of birds have been recorded including stork, heron and the white-faced tree duck. Herds of thirty or forty elephants are regularly seen and there are large numbers of hippos. Buffalo are present in the reserve but their roaming habits make their sightings less easy to predict. As on Nyika, there are plenty of smaller mammals.